The Atmanjai Wellness Spa is located onsite at the west end of our resort compound. Atmanjai is an internationally known healing and detox Spa hosting clients from all over the world. At Atmanjai our guests can choose from a variety of different spa treatments ranging from relaxing massage, foot reflexology, herbal therapies, aroma therapy, facials, manicures, body scrubs and body wraps. Atmanjai also offers full intensive detox, cleansing and healing programs that feature some of Phuket’s premier therapists and health practitioners. Our clients find the programs to be a great way to lose weight, feel better and an overall holistic practice towards better health. Please visit Atmanjai for a complete explanation of our programs and services. 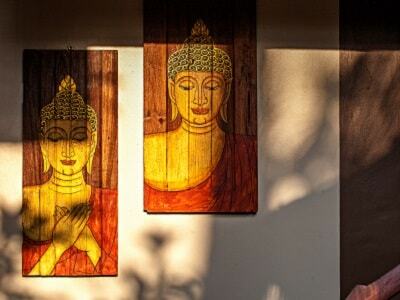 Atmanjai is an on-site international wellness spa offering detox, yoga & fitness retreats in Rawai. Atmanjai offers two types of customised detox program as well as pre and post cleanse programs. Atmanjai offers health holidays leaning primarily on yoga practices, healthy eating all at our beachfront location. Atmanjai offers customised fitness retreats taking advantage of our marvellous beachfront location. Gently offering relaxation for the mind and spirit Friendship Beach Resort & Spa features a wide variety of spa and health services to suit your needs. Whether it be a relaxing deep tissue oil massage at the beach sala or a full body seaweed scrub and wrap, our highly trained spa and massage therapists will take great care of you with superb service. If you are an early riser perhaps check out our daily yoga classes by the ocean or try out our herbal steam sauna to sooth aching muscles. For those planning a night out on the town, a manicure, pedicure and cleansing facial will surely brighten things up. Detoxing is a regime for those interested in cleansing their body of unwanted waste products accumulated over many years. It is magical that in 7 days you can eliminate unwanted toxins with little or no discomfort. Our program is a full Detox course designed to maximize a healthier body for you: body cleansing, rejuvenation, regeneration and weight loss are just some of the benefits. It is not unusual to safely lose more than a kilogram a day. Simply put, Atmanjai Fasting & Detox Programs cleanse the body of accumulated waste and restore levels of vitamins and minerals. This allows the body to operate effectively and heal itself of all manner of disease and ailments. We provide the knowledge and the environment – your body already knows what to do once it isn’t struggling under the load of years of poor eating and abuse. What happens to you physically, mentally and emotionally in as little as 7 days will seem miraculous. The Yoga holiday program at the Atmanjai wellness spa is a health holiday with a focus on various yoga practices and healthy eating based at our wonderful waterfront location in Rawai Phuket. Blending strong and gentle exercises, conscious breathing and mental intention, the Yoga holiday program helps you to experience a new kind of conscious body and mind exercise. A fully equipped open-air cross-training gym is located on site. Resort guests can utilize this facility at any time during the day. Perhaps you might also like to join in with classes that are part of our fitness retreats. With professional western trainers on hand to ensure you exercise correctly and effectively, these classes are both challenging and fun. These retreats are designed to be suitable for all levels of fitness, even if you have been lazy or stuck in the office for far too long. For those who want the benefits of participating in one of our fitness retreats, download this pdf for more details. To book your place in a fitness retreat, click on the button below to visit the Atmanjai Wellness Spa website and enter your travel dates.